The School of Health Sciences at City, University of London has been awarded a Certificate of Commitment in its first step towards gaining international recognition from the Unicef UK Baby Friendly Initiative (BFI) for a high standard of education in breastfeeding provided to health visiting students. The Baby Friendly University Award was launched in the UK in 2008 – the first such award anywhere in the world – in order to ensure high standards of education in breastfeeding and relationship building are incorporated into midwifery and public health education programmes. 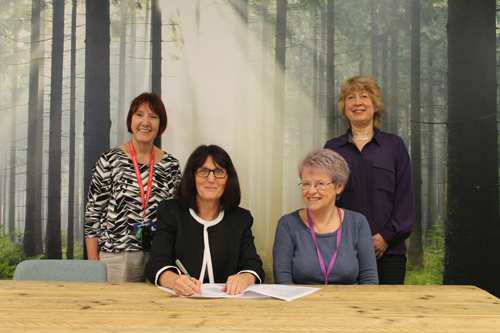 Specifically awarded to the BSc/PGDip Public Health (HV) Programme within the School, the Certificate will be presented by programme director Dr Val Thurtle to staff and students at the end of May, and subsequently shared with Specialist Practice Teachers in mid-June. "We decided to work with the Baby Friendly Initiative to ensure a high standard of education in breastfeeding for all student health visitors graduating from this course. We know that many women give up breastfeeding before they want to because of difficulties which could have been prevented if skilled help had been on hand. By ensuring that our students are fully skilled in how to help a mother breastfeed her child, more women will be able to breastfeed their babies for longer.